Injuries from building fires, explosions and flammable fabrics can be extremely painful, life-changing, and frequently fatal. Such injuries most often involve burns, but also may include head trauma and broken bones from explosions, cuts and abrasions from flying or falling debris, and inhalation of smoke or toxic fumes. Because cases involving such injuries often can be very complicated, establishing liability and recovering damages require the expertise of a lawyer with prior experience handling fire and explosion cases. In building fires and explosions, the questions likely will encompass the source of the event, who or what caused it, whether the property owner had adequate safety and warning systems in place, and whether exits were clearly marked and the pathways to them clear. In cases involving flammable fabrics — such as clothing, sleepwear, bedding, mattresses and furniture coverings — the issues will be entirely different. They may involve government safety regulations, manufacturing standards, and whether the fabric was being used for its intended purpose. The Law Offices of Frank L. Branson can get to the bottom of questions like these. 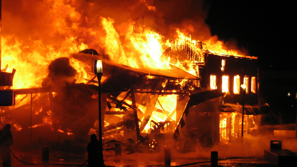 Our team of lawyers and investigators has experience in handling fire and explosion cases — determining who was responsible and holding them accountable. We have successfully handled several cases involving fires, explosions and violations of the federal Flammable Fabrics Act. To learn more about our experience in building fires, explosions and flammable fabric related matters, we invite you to contact the firm here.